The Median Price per Square Foot (in homes sold) rose by 14% in Sun City and 13% in Sun City West in January when compared with the same month last year. Looking back over the last few years, we can see slow pricing appreciation in 2016 followed by consistent upward pricing pressure in 2017 and 2018. The older I get, the more I find myself saying "remember when..?" 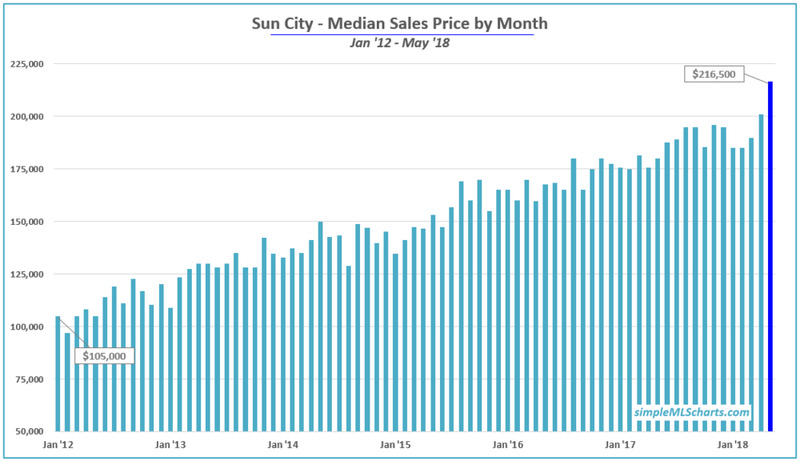 Well, here's irony for you - Remember a few years ago when the Median Price in Sun City was less than $100,000? 2012 doesn't seem like too long ago, but the median price has more than doubled since then, from a low point of $97,000 in Feb '12 to last month's $216,500. Wowza.